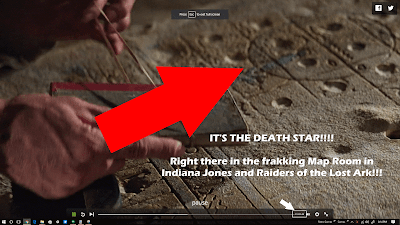 Notes and Nerds: A Star Wars Easter Egg You All Missed! A Star Wars Easter Egg You All Missed! We are all familiar with the above image. R2D2 and C3PO in the hieroglyphs there. 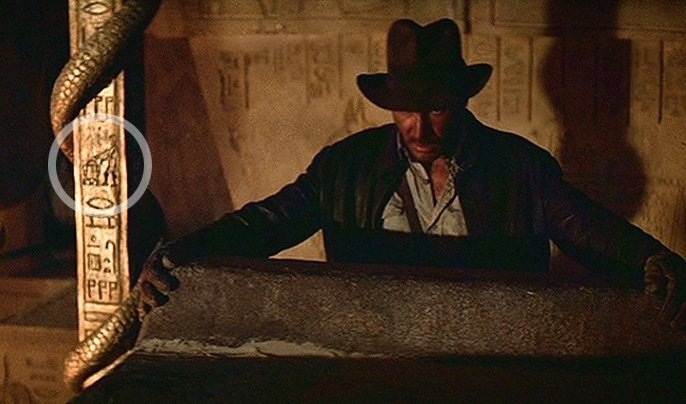 However, there may be ONE little bit of Star Wars in Raiders of the Lost Ark that you all have been missing for the last 36 years. In the Image there, we point to the circle, which has no other similar appearances in any shot during this portion of the film. There is a "beam coming from the one side of the circle shape, and if you look, it even looks like spots that have the "dish" shape in it. Yes, this could be a stretch, but that definitely looks like a possible Death Star there.